Apologies for this post being a little later than I'd have liked, but I've been under a cloud of "blegh" for the past week and it's been difficult to get anything done. Like having a lingering cold, except instead of sneezing you don't have the energy to do anything except watch season 3 of Star Trek: The Next Generation. In this week's roundup over at The Bubble Chamber I wrote about some new research exposing the potential pitfalls of sexual stereotyping, and linked to the disastrous EC's "Science: It's a Girl Thing" video (which was so offputting when released this past summer that it immediately went viral). Fortunately, the marketing for the EC's continued "Science: It's a Girl Thing" campaign seems to have overcome its initial pinkwashing and now features girl models doing more than strutting the catwalk: taking pictures, standing in front of blackboards, and daydreaming. Writing about "Science: It's a Girl Thing" brought to mind an incident from a few weeks ago that also involved gender stereotypes and science. I live in Toronto and I'm a subway commuter on the TTC. 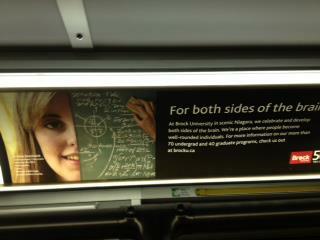 Recently I have noticed two of Brock's "For both sides of the brain" campaign on subway cars. 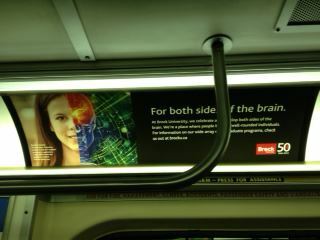 It seems as though all of your posters on the TTC involve half of a female student's face and the other half a science- or technology-based image (a cyberspace brain, or a chalkboard full of equations). There's an unfortunate connotation that the two sides of the brain are the female side and the math/science side. A quick Google search showed me that there are more images in the campaign, but I have not seen any of them in Toronto. I am very interested in the way science is represented to the public, and I'd appreciate any response about this campaign. Thanks for your note. I'm glad that Brock's Both Sides of the Brain materials are catching your eye, that was certainly our intention. I think your perceptions about the BSB campaign are distorted by the coincidence that both of the 2 ads you saw involve women and math-science themes. I hope this addresses your concerns. Thanks again for writing. It's true that clicking the first link brings up all kinds of different examples of smiling half-faced people. I'm not entirely convinced that there aren't any latent stereotypes at play (women are juxtaposed with fruit/children's faces/yoga poses/docile animals, men with angry hockey faces/predatory animals) but after giving it some thought I think the real problem with this campaign is that their "both sides" theme might not be doing all it could for Brock. As I said earlier, each photo is half of a person's face, with the other half represented by an image of their research or an important cause or hobby. But nothing about the images suggests "both sides" of anything, except the fact of there being two halves. If Brock is trying to market itself as a university where students can develop multiple interests ("both sides" of their brains), why do they only show one thing the student is into? Why not show music AND sports, the debate team AND drama class? Why not show a student engaged in two different things, using "both sides" of their brain? I don't know very much about Brock, but I do think the undergraduate years are a wonderful time for students to explore all of their interests, even the ones they didn't know they had until they got there. Brock might just need to get over this "both sides" campaign to really showcase the well-rounded lives of its community members.